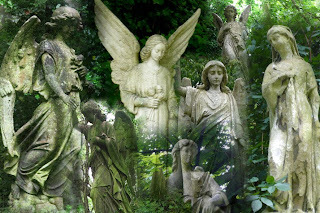 Since we're hoping to hear from Kate shortly re timing for our Islington rendezvous this afternoon, I'm just going to post a composite photo Michael put together on yesterday's visit to London's most atmospheric cemetery. Amazing timing--I had actually typed the period at the end of my first sentence when the phone rang. We're now back from a memorable evening. More on that and Highgate later.